Even being back in KL, I'm still physically tired. Today I went for a Decleor aromassage facial and Decleor hot stone massage. The body massage was sixty minutes and first trial price at Rm125. The facial was part of a package which I had bought from last year. Anyways, came home and had a long nap... Really needed it! But anyways, decided to start on the baking trials today. Unfortunately I only found salted butter in the fridge. I don't know how it will affect the rest of the recipes, but well...for baking in general, unsalted butter is preferable as it allows the chef to have better control of the taste of the cakes. did the baking in three batches. Unfortunately because the oven is so small, I had to divide the baking of items into a few times. I couldn't really control the top and bottom temperature as it was just one preset dial. 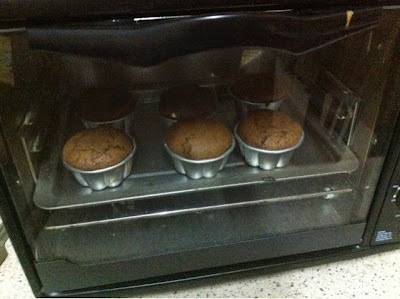 I had scaled the recipe down to 12 cupcakes but even that was quite a lot for a small oven. 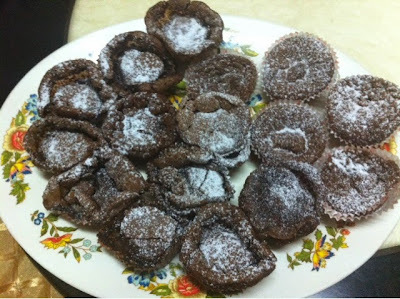 I tried baking the cupcakes with out a mold. That was a bad idea. For this particular recipe, the mould actually protects the batter from over cooking. It is still edible but it won't help me pass during the exam!! What we are looking for in this recipe is to have a soft middle. It takes about 12-15 mins to bake, and will look a bit liquidy. But that is okay, as the chocolate bit will set. I don't think I will have so much trouble with this batter, but next I want to try baking it in a bigger oven so I can use the bigger moulds. As for the moist cupcake (as per the recipe) I think the texture takes some getting used to. Need to try making next batch soon! !